Product has not been associated with this account, therefore your catalog will be empty. Please contact Customer Care for assistance. 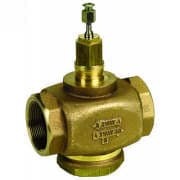 Used for two-position or modulating control of steam and water and glycol solutions (to 50 percent concentration) in heating or cooling systems. Sizes range from 1/2 to 2 inches. Stainless steel stem prevents corrosion. Valve designs provide equal percentage characteristics of flow for close control of water, and linear characteristic of flow for close control of steam or chilled water. Valves utilize direct mounting, electric or pneumatic linear valve actuators; Q5001 linkage with Modutrol Motor; or Q5020/Q5022A linkages with direct coupled rotary actuators to operate the valve. Not suitable for combustible gases. Chilled or hot water with up to 50% Glycol or Steam. Not for use with fuels.